YWCP offers four choir levels: Prelude Chorus, Allegro Chorus, Vivo Chorus and Young Women’s Chorus. Each level has its own curriculum and musical objectives. Based upon an audition, a singer is placed in a chorus appropriate for her age, vocal maturity and music reading ability. The grade levels are approximate markers, and some flexibility is given to certain situations.We also offer a non-auditioned class for girls in kindergarten and 1st grade: Arietta Singers. 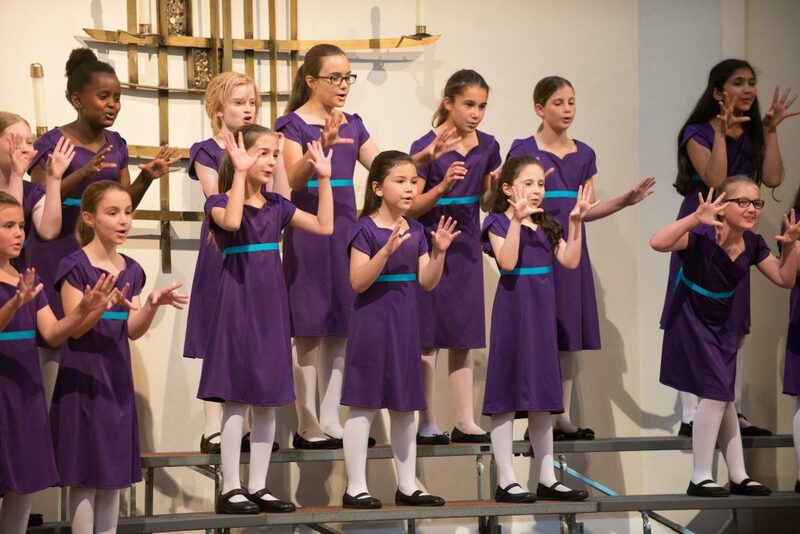 All YWCP ensembles teach young women substantial music skills and through the study of music, each chorister learns important life lessons such as confidence, focus, self-discipline, problem solving, responsibility and teamwork. A singer in our training choirs is promoted to the next level based upon her musical growth during the year. Acceptance into the highest level, YWC, requires a successful audition in which the young woman demonstrates readiness for learning challenging repertoire, and performing with advanced vocal skill and professionalism. It is a gift to have a conductor who wants to learn about the singers as people as much as teach them music. Every time I hear the girls sing I am brought to tears by the beauty of their voices. Arietta Singers emphasizes a foundation for healthy singing while engaging the whole child in fun, interactive musical learning. It is an outstanding way to explore a girl’s interest in music and singing, and her potential for future opportunities in YWCP. 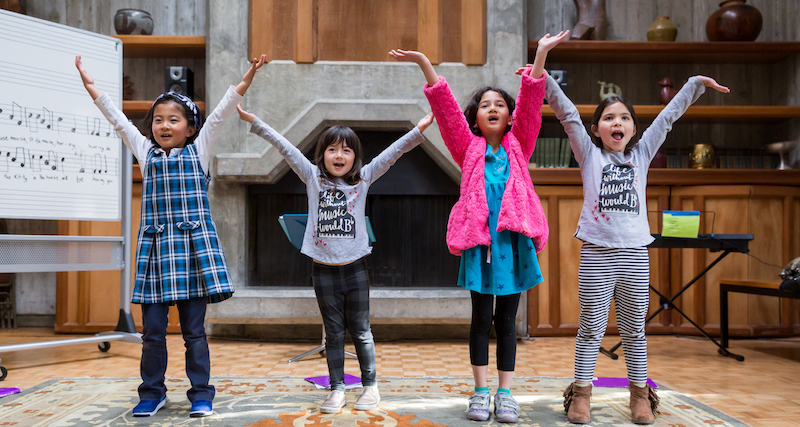 Using a Kodály-inspired curriculum, class members build basic musicianship skills and vocal technique while actively engaging their minds, bodies and voices in folk songs and dances, music games, simple percussion playing and age-appropriate unison choral music. Arietta performs for their parents twice a year. The class is limited to 15 singers. The Spring semester of Arietta meets January-May. Spring semester tuition is $565 and includes an Arietta T-shirt. Scholarships are available. 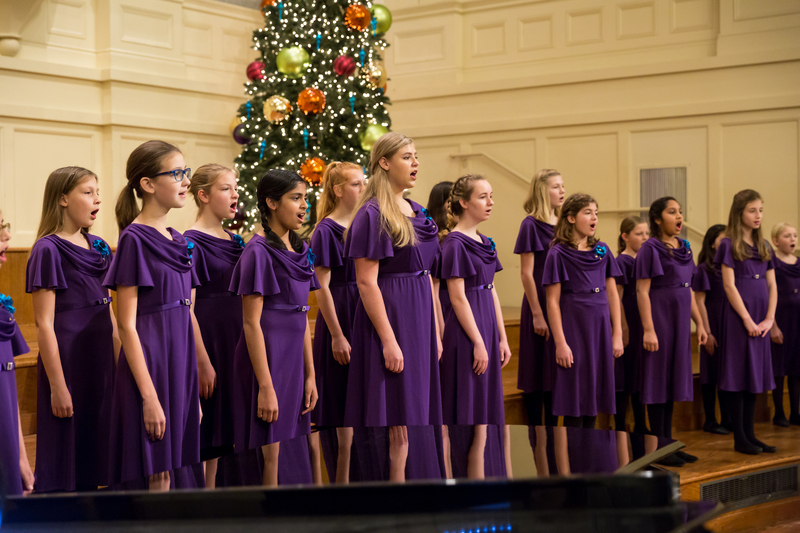 Through a Kodály-inspired music curriculum, Prelude choristers learn basic vocal techniques, sight-reading and performance skills, and meet other young girls who love to sing. A typical class will include folk dancing and games, acquiring music skills through solfege training and written music theory, and singing unison and two-part repertoire in many languages. Prelude presents 2-4 public performances yearly. Sign up for our next audition. YWCP Allegro choristers have some musical training. Through a Kodály-inspired music curriculum, they develop a free vocal production, more advanced music theory, ear training, and performance skills. They learn to sing in two- and three-part harmony with repertoire in many styles and languages. This ensemble performs approximately 3-4 times a year. Vivo Chorus is the most advanced level of YWCP’s training program. Here choristers learn advanced sight-singing skills, and study more complex music theory and ear training. In Vivo Chorus, the singers continue to develop their vocal skills to produce a free, strong, resonant voice, and occasionally have the opportunity for group and private voice lessons with a professional teacher within the rehearsal. They perform 4-6 times a year, show a strong commitment to the group, and represent YWCP in some outside bookings. 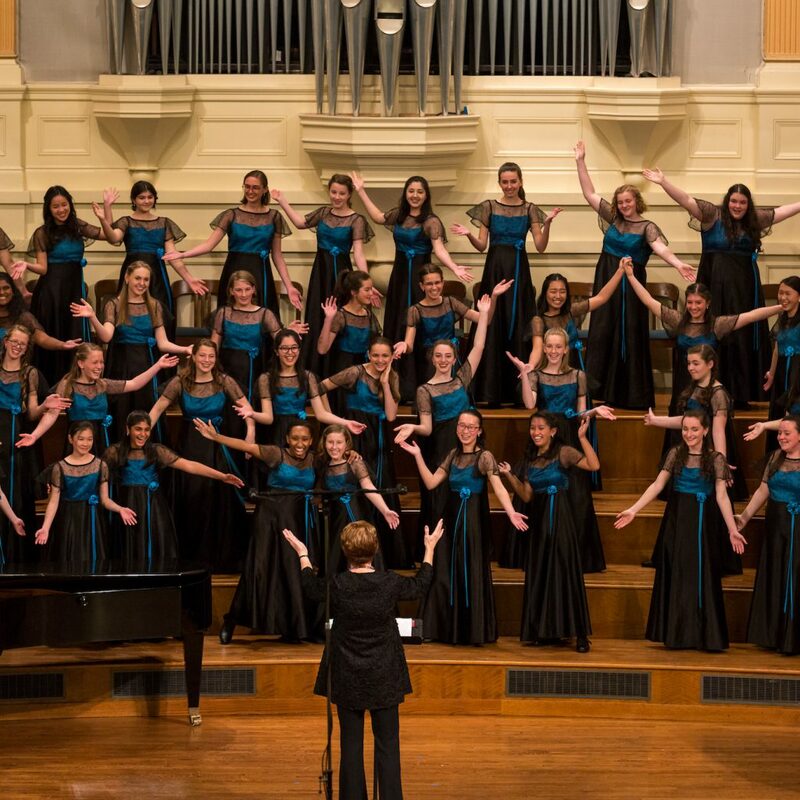 The Young Women’s Chorus is YWCP’s premiere performing ensemble and is comprised of singers who exhibit excellent vocal technique and exceptional musicianship skills. 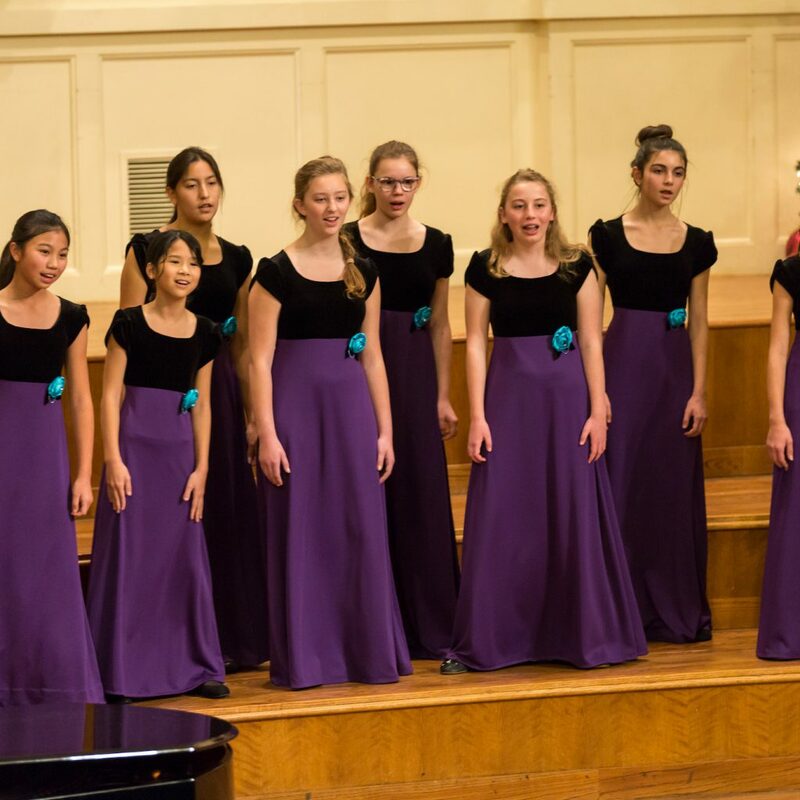 YWC sings challenging choral music for women’s voices, emphasizing classical compositions from all eras, and including world music, jazz and Broadway selections. All members of YWC take voice lessons from a professional voice teacher in small classes every other week. Led by Artistic Director, Dr. Susan McMane, YWC presents an annual concert series in the San Francisco Bay Area, tours annually nationally or internationally, and appears with renowned guest artists. YWC sings 5-6 concerts in the Bay Area and 5-6 concerts on tour every year.